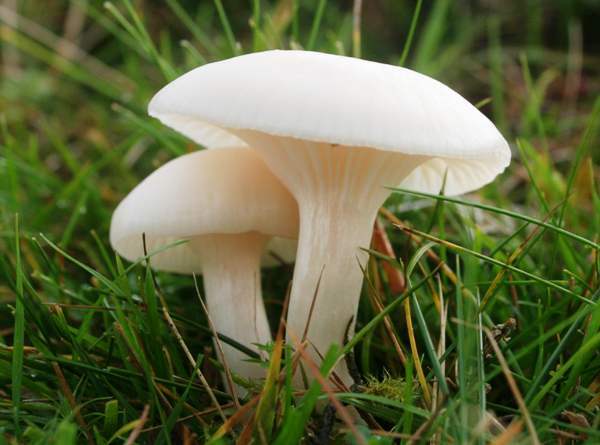 A frequent species, this ivory-white waxcap occurs in upland permanent pasture that is kept short by grazing sheep; it is seen occasionally also in open woodland and quite often in parkland and on garden lawns. It occurs mainly in areas where the soil is acidic. This smallish waxcap is sometimes overlooked when it is hidden low down among the mossy grass of churchyards and pastures. There are several other very pale members of the waxcap family, and identifying them usually requires microscopic examination. 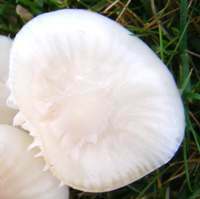 The very widely spaced gills of this little mushroom and the almost invariably wavy form of its stipe are helpful distinguishing features not shared with many other white or ivory-coloured waxcaps and woodwaxes. The Snowy Waxcap is probably the only waxcap species that could reasonably be described a 'common' across Britain and Ireland. One of the main reasons for this is its ability to tolerate moderate amounts of artificial fertilisers that would eradicate most other waxcaps. 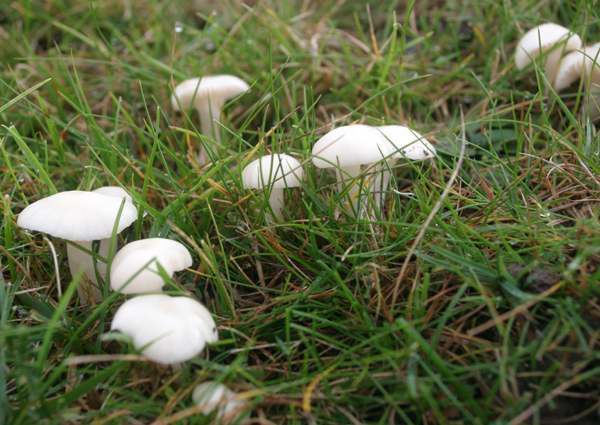 Any previously treated lawn lawn that is simply mown and the grass removed but is no longer dosed with 'weed and feed' chemicals or moss killers can be expected to sprout Snowy Waxcaps within five to ten years. Some of the rarer waxcaps will not appear in such places until at least half a century has passed. The basionym dates from 1781, when Austrian mycologist Franz Xavier von Wulfen (1728 - 1805) described the Snowy Waxcap and gave it the scientific name Agaricus virgineus. (In those days most of the gilled mushrooms were included initially in the genus Agaricus.) Having been transferred to the genus Hygrocybe in 1916 by American mycologist William Alphonso Murrill (1869 - 1957), the autonomous form of this waxcap was given the scientific name Hygrocybe virginea var. virginea in 1969 by British mycologists Peter Darbishire Orton (1916 - 2005) and Roy Watling (born 1938). 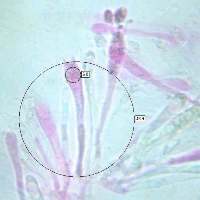 The currently-accepted scientific name Cuphophyllus virgineus dates fom a 1989 publication by Russian mycologist Alexander Kovalenko. Two other variants of this species occur in Britain, where their main strongholds are in upland acid grasslands, particularly in the Cambrian Mountains and Brecon Beacons areas of Wales. Cuphophyllus virgineus var. fuscescens (Bres.) E. Campo (Syn. Hygrocybe virginea var. fuscescens (Bres.) Arnolds) is a very rare find in Britain; it was described by Dutch mycologist and grassland fungi specialist Eef Arnolds in 1985; its cap is buff with a darker brown centre. Also very rare is Cuphophyllus virgineus var. ochraceopallidus (P.D. Orton) E. Campo (Syn. Hygrocybe virginea var. ochraceopallida (P.D. Orton) Boertm. 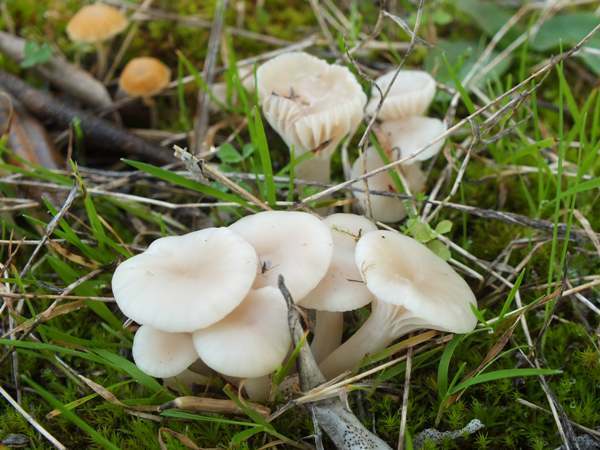 ), which has a universally ochraceous cap without a darker centre; this variant was described by Danish waxcap specialist David Boertmann in 1995 - demoting from species rank the two waxcaps previously known as Hygrocybe fuscescens and Hygrocybe ochraceopallida. Cuphophyllus virgineus was described in 1772 (under the scientific name of Agaricus niveus) by Giovanni Antonio Scopoli in the second edition of his Flora Carniolica. Since then it has acquired a plethora of synonymous names including Agaricus subradiatus Schumach., Omphalia virginea (Wulfen) Gray, Hygrophorus niveus (Scop.) Fr., Hygrophorus subradiatus (Schumach.) Fr., Hygrophorus virgineus (Wulfen) Fr., Camarophyllus virgineus (Wulfen) P. Kumm., Camarophyllus niveus (Scop.) Wünsche, Hygrocybe nivea (Scop.) Murrill, Hygrocybe subradiata (Schumach.) P. D. Orton & Watling, Hygrocybe virginea (Wulfen) P. D. Orton & Watling, Cuphophyllus niveus (Scop.) Bon, Cuphophyllus subradiatus (Schumach.) Bon, and Cuphophyllus virgineus (Wulfen) Kovalenko. And there are others! When you see that nivea is one of the former specific epithets of this waxcap, it is a clue to why this pure white (usually) waxcap was given the specific epithet virginea or virgineus. The two variants have lesser claims to the virginal characteristic, of course. 2 to 6cm in diameter, ivory-white but often tinged very slightly with yellow, the caps are convex at first, expanding to become almost flat but usually with a slight umbo. Somewhat greasy on the surface, the flesh of the waxy caps is almost pure white. The thick, waxy gills are very widely spaced and have decurrent attachment to the stipe. 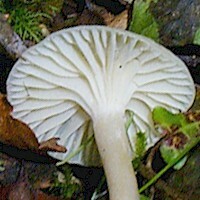 With age the pure-white gills tend to become more cap coloured (ivory). Slender and often curved, white at the top and usually a little darker towards the base, the stems range from 2 to 6mm in diameter and 3 to 7cm tall. 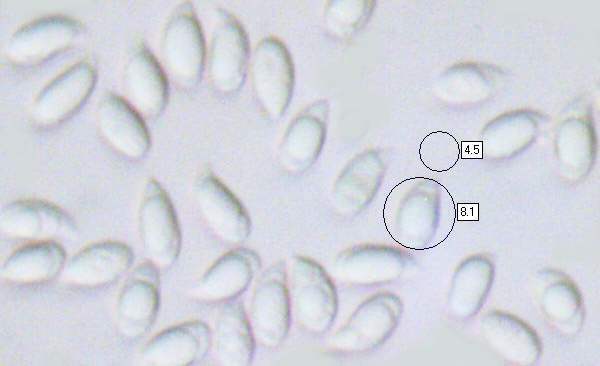 In most instances the basidia are four spored (left), but some collections have two-spored basidia. 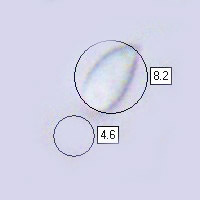 Ellipsoidal, smooth, 7-8.5 x 4.5-5.2µm for four-spored basidia (see above); 9-12 x 5-6.5µm for two-spored basidia; inamyloid. No noticeable odour; a slightly unpleasant taste but not distinctive. Cropped grassland that has not been subject to significant amounts of artificial fertiliser treatment in recent years; also churchyards, unfertilised/treated lawns and parkland, and sometimes in woodland clearings; most often on acidic soil. Hygrophorus eburneus is very similar but its gills are more closely spaced and it is much more slimy than Hygrocybe virgineus. The Snowy Waxcap is probably the most common of the Hygrocybe species seen in Britain and Ireland, and it is one of the few Hygrocybe species that are fairly common also on a European scale. 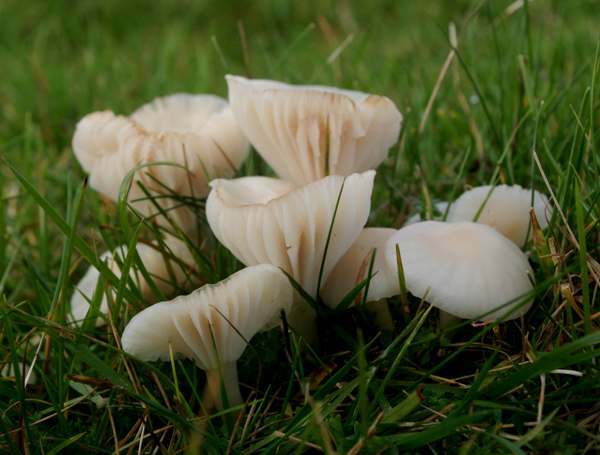 There would be rather less concern if people collected these grassland fungi rather than some of the rarer Hygrocybe species. Some field guides state that Snowy Waxcaps are not only edible but also very good; however, anyone gathering white-gilled mushrooms for food should be aware that some of the most deadly poisonous mushrooms - the Destroying Angel Amanita virosa, for example - are white as also are several grassland species that can cause very unpleasant stomach upsets. Accurate identification is, as always with wild mushrooms, absolutely crucial.